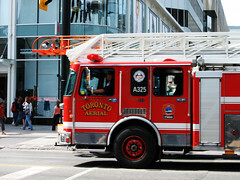 Toronto Fire DepartmentOriginally uploaded by simmogem. After my hectic week in fast paced Toronto I am back in Calgary (which seems so small now). Toronto is much like Sydney and has the most fabulous shopping – not that I did much of that of course. Dundas Square has two huge shopping malls, the Hard Rock Cafe and the biggest TV screens I have ever seen. Also you can see my diet went out the window, but with at least three hot dog vendors on every corner it was to hard to pass it up – not bad for $3! There will be much more on Toronto when Simon and I return in December. Oh the conference – the whole point of my visit, it was great. Those of us from Australia were amazed at what a Union of more than 200,000 members can do. The IAFF is a phenomenal organisation, with the resources to pull off a relief effort in hurricane affected New Orleans and Florida far better than the US Government and the community support to raise more than $23 million dollars for the Muscular Distrophy Association last year. Their political influence and activism in North America rivals anything I have seen in Australia. The Toronto Local hosted the convention and did a wonderful job. I met a number of people from all over, including New York, Florida and Washington DC, all of whom are keen to meet with Simon and I as we continue our travels. But now it is back to Chintz and little ol’ Calgary – it is nice to be home. Author GemmaPosted on September 3, 2006 Categories Toronto3 Comments on I'm Back!